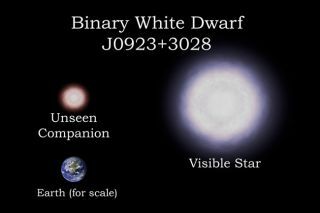 The binary star system J0923+28 consists of two white dwarfs: a visible star weighing 23 percent as much as our Sun and about four times the diameter of Earth, and an unseen companion weighing 44 percent of the Sun and about one Earth-diameter in size. The stars are currently separated by about 220,000 miles and orbit each other once per hour. The stars will spiral in toward each other and merge in about 100 million years. Astronomers have discovered a dozenpreviously unknown double-starsystems, each on a course to end in spectacular explosions detonated bythecrash between their two small, dense stars. All of the newfound binarystar systems consist of two white dwarf stars. It is thesestars that areon a collision course in each system. "These are weird systems ? objectsthe size of theEarth orbiting each other at a distance less than the radius of thesun,"said astronomer Warren Brown of the Harvard-Smithsonian Center forAstrophysicsin Cambridge, Mass., lead author of a pair of papers reporting the find. The astronomers discovered 12 binarywhite dwarf systems ?about half of which will likely see their stars merge into one, thenexplode. The tightest binary system, one inwhich its two starscircle each other once every hour, will merge in about 100 millionyears, the scientistsestimated. The whitedwarfs found in this survey are relatively lightweight,holding only about 20percent as much mass as the sun. They are made almost entirely ofhelium,unlike normal white dwarfs made of carbon and oxygen. "These white dwarfs have gone througha dramatic weight-lossprogram," said Carlos Allende Prieto, an astronomer at the Instituto deAstrofisica de Canarias in Spain and a co-author of the study. "Thesestarsare in such close orbits that tidal forces, like those swaying theoceans onEarth, led to huge mass losses." Because they whirl around so close toeach other, the whitedwarfs' gravity can stir space-time around them, creating expandingripplesknown as gravitationalwaves. Those waves, which scientists have yet to directlydetect, arethought to carry away orbital energy and cause the stars to spiralclosertogether. The six newfound star systems withmerging white dwarfsboost the number known of double-star setups in the act of merging intoone. "Wehave tripled the number of known, merging white-dwarf systems," saidco-author Mukremin Kilic, also of the Harvard-Smithsonian Center forAstrophysics. "Now we can begin to understand how these systems formandwhat they may become in the near future." When two white dwarfs merge, theircombined mass can exceeda tippingpoint, causing them to detonate and explode as a Type Iasupernova. Brown and his colleagues suggest thatthe merging binariesthey have discovered might be one source of less flashy supernovas ? araretype of supernova explosion 100 times fainter than a normal Type Iasupernova,which ejects only 20 percent as much matter. "The rate at which our white dwarfsare merging is thesame as the rate of under-luminous supernovae ? about one every 2,000years," Brown said. "While we can?t know for sure whether our mergingwhite dwarfs will explode as under-luminous supernovae, the fact thatthe ratesare the same is highly suggestive." The paper announcing their find willbe published in anupcoming issue of the Monthly Notices of the Royal Astronomical Society. ExplodingStars: Is Earth at Risk?